The Australian Cattle Dog names list is filled with names suitable for this hard working, farm loving herding dog breed. Many of the names on this list come from the breed’s native Australia. Examples include Sheila, Digger, Jarrah and Miki. The Blue Heeler, as they are also known, may not fit as well in the famous dog names category as a Chihuahua or Shih Tzu, for example, but there are a couple dogs of note. Zip is the name of an Australian Cattle Dog Blue Heeler that starred in Last of the Dogmen, a 1995 film with screen actors Tom Berenger and Barbara Hershey. While Australian Cattle Dogs have also appeared in Mad Max 2: The Road Warrier, The Blob, Babe and other movies, most are nameless. There are also not too many of these dogs that fit in the famous Australian Cattle Dog names list because they are owned by famous people. You may just have to make a name for yourself or your Blue Heeler dog and change the trend. Something to remember when naming your Australian Cattle Dog is to match your dog’s personality to their name. If you will be using your dog for herding, you should also consider their name in light of their purpose. For more great ideas, visit our list of famous dog names or one syllable dog names. If you have a name to share with the rest of us, please use the form at the bottom of this page. You just might make someone’s day! To learn more about this working dog breed, visit our Australian Cattle Dog breed information page. Learn about the Australian Cattle Dog temperament, trainability, and even a little of the breed’s history before deciding on this or another dog breed. Below is a list of my favorite 101 Australian Cattle Dog names. If you don’t find a name you like after browsing the list, return to our Dog Names by Breed page to see more categories, or expand your search to our list of more than 4,000 puppy names. Aussie Slang word for a person from Australia, appropriate for the Australian Cattle Dog names list. Austin From Augustine – Exalted one. Bailey Trusted guardian of others property. Bandit One of the most popular Australian Cattle Dog names in the United States. Baron A low ranking nobleman. Blitz I love this name for a herding dog. Blue A color between green and indigo. Great name for the Australian Cattle Dog / Blue Heeler breed. Brizzie Slang for Brisbane, the capital of Queensland, Australia. Buddy From Budd – The welcome messenger. Famous Name: George “Buddy” Guy (born 30 July, 1936) is a five-time Grammy Award-winning American blues and rock singer and guitarist. He ranked 30th in the 100 Greatest Guitarists of All Time list by the Rolling Stone magazine. Coorah An Aboriginal word for woman. Copper A reddish brown metal – as in copper penny coins. Also slang for a police officer. Corey Chosen one – from the hollow. Dag A goof, humorous person. Dash To move with haste, to rush. Punctuation.Long sound in Morse code. Famous Name: A popular American actor, Vin Diesel (born 18 July 1967) started acting at age 7 in theaters. He is best known for his action films, like The Fast and the Furious franchise. Doodles Always has to be the center of attention. Always. Dynamo Frisky. Does not seem to lose energy. Edwin Rich and fortunate friend. Footy Shortcut of football. Or practically anything that refers to a foot. Frank From Franklin – Free-holder of property. Gopher Name of a rodent with thick body and short legs. Grumps Sulky and cranky. Is easily irritated. Ivan A Russian form of John. Jarrah An Aboriginal word for a type of eucalyptus tree. Jasper From Casper – Master of the treasure. Jenkins Prone to accidents. Unbelievably gets into all sorts of troubles. Karri A Western Australian Aboriginal word for a type of eucalyptus tree. Kiwi Australian slang for New Zealander. Kolya Aboriginal word for Winter. Kylie Western Australian word for boomerang. Famous Name: Kylie Minogue (born 28 May 1968) started out as an actress in Australia before eventually making it big as an international recording artist. She is the only performer to put her first 13 singles in the UK Top 10. Marty From Martin – Warlike person. Matilda From Mathilda – Brave little maid. Miki An Aboriginal word for the moon. Famous Name: Eddie Murphy (born 3 April 1961) is the voice of the funny and adorable character Donkey in the popular Shrek series. He has starred in about 40 movies, grossing more than $6 billion worldwide. Needles A small slender instrument used for sewing. Nipper Slang term for a young surfer/lifesaver. Also describes the Australian Cattle Dog’s herding method. Orbits Move in circles. Probably a dog who enjoys chasing his tail. Paco Eagle (Spanish for Frank). Panda A black and white bear from the mountains of China and Tibet. Pickles Food flavored in a solution of vinegar. Riggles A wriggler who can’t seem to sit still. Ripper Loves tearing or breaking practically anything. Rocky An underdog who made it big. Roo Slang for kangaroo. One of the cutest Australian Cattle Dog names. Roo Roo A sound that a dog makes that is between whimper and a bark. Runway A strip where vehicles or models run or walk through. Sapphire A clear, usually blue gemstone. Shelia Australian label for a woman. Shepps Referring to a relative or close friend. Silo Slang for tall or long. Sooky Animal or person who is soft or tame. Storm Strong winds accompanied by rain or snow, thunder and lightning. Uncontrollable. Tallara Another name for rain. Taz A cartoon character who enjoys spinning and being mischevous. Toby From Tobias – God is good. Tripper A tripping or triggering device on a mechanism. Trooper A state or mounted police officer. Also a member of a cavalry unit. Trouble A cause of disturbance or difficulty. Turbo Driven by a turbine – turbocharged. Wally Someone who makes mistakes. Zip Australian Cattle Dog that starred in the 1995 film, Last of the Dogmen. Ziva Youthful, beautiful, and energetic. 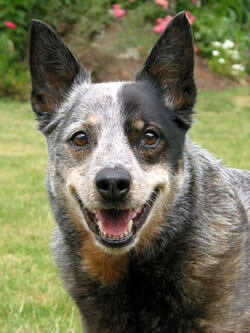 Can’t find the name you like on the Australian Cattle Dog names list? Don’t give up. Return to our Dog Names by Breed page to do some more exploring. If you have a great name, tell us about it! ‘Bindi-eye’ – An Australian perennial plant that grows in lawns and grassy areas which bears a small, burrlike seed.